In the midst of the massive buildup to the decision and of the bitter debates about it, that fact seemed notably absent, in my own mind and in the media. American History class was a long time ago. The rest of her article was focused on how important it is in journalism, and in the office, to stay mindful of the facts. Point noted and accepted. The challenge for we humans is developing an awareness of how differently we perceive facts. Assertion – is a measurable, observable fact. Assessment – is an opinion of that fact. My favorite example of this is height. I am 5 feet, 2 and ¾ inches tall. (Hey, the ¾” is important!) This can be measured by a yardstick or a measuring tape or a child’s height chart for that matter. People can agree that this is a fact: yes, Joanie is 5 feet, 2 and ¾ inches tall. And yet, different people will have different opinions about that fact. I think I’m short. My 4 year old niece thinks I’m very, very tall. Others have no opinion or have never seen me without heeled shoes or so on. Certainly, actual conflict is not this simple, and my height is not about to start any great debates. But this example is an easy litmus test when you need to determine between facts and opinions. Temperature is another. Anyone ever have an argument in a car about whether 68° is too hot or too cold? The deal is this: we are selective when we look at facts. And even when we see the same things, we interpret them differently. It’s how our human brains are wired. 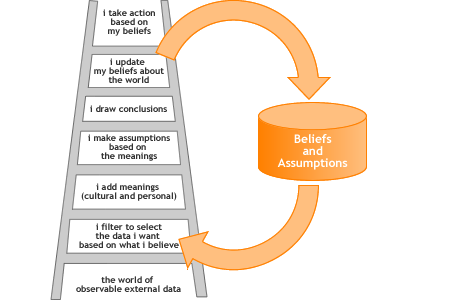 You can learn about this by studying the Ladder of Inference, which was developed by Chris Argyris. 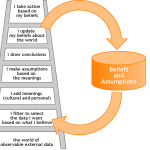 The Ladder concepts are powerful tools to learn and use – I’m happy to discuss them. This is always a favorite topic in the executive workshops I teach. For today, I want to highlight one key point learned from the Ladder: we invite trouble – and conflict! – when we think our opinions are the facts, present them as such, and encourage or expect others to follow suit. And we all do it. What are the facts of the situation? Try as best you can to capture the situation as a video camera would have recorded it. Students of the Ladder know that by definition we all have our own selective video cameras, but this step is important and worthy, especially to the other person. Next ask yourself two core questions: What might I missing? What assumptions am I making? These steps are simple, but not easy. They open the door a little wider and give you a chance to reframe situations and re-engage in conversation from this widened perspective. A client recently shared that he was able to manage a tense situation with his team simply by following step 1. In the wise words of Bill Murray: That’s the fact, Jack!